My female frog laid eggs twice last month and seemed lethargic before and after, which is her normal behavior during this time. The lethargy didn't go away and her tank was pretty filthy, but she was eating, as far as I know. This past Monday when I came home and went over to her and looked at her face to face, the tip of her face (nose and mouth area) looked cyanotic. I panicked and figured her tank water was possibly poisoning her or asphyxiating her, so I quickly took her out of her tank and put her in her temporary tank with straight tap water. There was no time to let the water air itself out for 24hrs. I figured it couldn't be any worse than the water she was in, which seemed to be hurting her. I also remembered talking to a worker at a PetSmart who said he had the same species frog and kept it in a small tank in the bathroom and always just replaced the water with straight tap. I then proceeded to clean the entire tank, complete water and media change in the filter. I did leave the slightest, slightest water at the bottom of the tank with the gravel. Cleaned her plants, rocks, and cave by hand under tap water, didn't scrub them clean like I usually do to remove the greenish stuff that grows on them. I figured there was some good bacteria on there for her safety, since I did a 99% water change. There was a lot of old ReptoMin pellets and about 3 old shrimp mixed with the rocks, also some loose skin. The tank definitely needed a good clean. I had expired ammonia and nitrate/alkalinity strips which I used and the water indicated to me within normal limits. The cyanotic appearance on her face looked like it was worsening, and when I used the test strips in her temporary tank they didn't come out as good as her newly cleaned permanent tank, so I placed her bank into her permanent, full time tank, all within about 4 hrs. She seemed to settle back into her tank, but didn't eat anything. That was 3 days ago and still hasn't eaten anything at all. The clean tap water has now had a chance to air itself out, with her in the tank. Could it just be that everything was to shocking to her system? I would also say that today her face looks normal again, no more reddish purple appearance, thank goodness! The only thing she has ever eaten are ReptoMin pellets and freeze dried shrimp (which she normally LOVES, but wants no part of now), she doesn't eat anything at all. I just noticed that she's laying on top of her tall plant, which goes to the top of her water. She loves laying at the tippy top, but hadn't been doing that either, until now for a short while. She seems better today then yesterday, except for the not eating anything. I read in a website that they can go for a month without eating, so that would give me time to see improvement. What could be wrong, what can I do? Should I wait and keep observing her, or should I take her to the animal hospital? They have specialists which specialize in exotic pets...I've never taken her anywhere. She's always been great. I'm attaching a few photos. I appreciate any help and guidance, thank you in advance. Hello Neale and thank you for your thorough response, I really appreciate everything you wrote. I know she may appear bloated to you, but not to me. She's normally bigger up top and her thighs are usually a lot more chunky. She's definitely thinned out a lot along the bottom side of her back, I can see a thinner waist with the end of the ribcage I imagine. I mean, you know a lot better than I do as to what a bloated ACF looks like, so I don't really know. If she takes the antibiotics and the salts and didn't really need them, can they hurt her? Also, can she live up to a month without eating? By the time I order the antibiotics and salts and get them, it will be a few days. It would probably be quicker if I took her into the hospital? And hopefully they will have everything at hand. Do you have these supplies? Are you in NJ by any chance. On Monday, when I put her into the temporary tank, I also remember the back of her left thigh starting to appear darkish purple under the skin. I was wondering if there was an organ there that was being affected at the time. That went away that night after I placed her back into her permanent cleaned tank. The only thing that stands out to me now, is a faint blemish she has on her chest/belly area, slightly to the left of her midline. It's very minor, but that's the only thing that stands out to me, except for her looking thinner. That blemish I have to say was there before Monday when I came home and she looked cyanotic. I thought maybe she had hurt herself somehow, but is still there. Could that be a sign of a bacterial problem? I forgot to include this picture, I tried to get the blemish, but didn't come out to clear. Also, I took about an inch level of water tonight after reading your email, so the water has more splash and gets oxygenated better. SHE ATE!!! She just snatched a freshly placed pellet and pulled it into her mouth!! So happy I could cry. She only took one, but that's such an improvement. I often wonder if she has trouble seeing. Thank you again for all the feedback, so appreciated. I will continue corresponding regarding her progress if you don't mind, until she's back to normal. It's like consulting with your mom when you have your first baby and feel lost and scared when they're sick and you have no idea as to what to do. Hello again....thought of another question. Pinky laid eggs twice recently. Every time she lays eggs, she ends up eating them, and I let her. After the first time she laid eggs 2 yrs ago. I read online that they could be removed from the tank or left and the frog would just eat them. Do you not recommend this? I sent out an email last night and was wondering if it had been received. Not sure what has happened. Last time I communicated with you I was taking her to the vet. I took her, they weighed and examined her, they swabbed the 2 lesions on her chest to check for bacterial infection - was negative, and took a sample and sent it out for a possible fungal infection they say frogs can get. I'm actually still waiting for the results of the fungal infection test. They force fed her, since she was going on 2 weeks of not eating. The vet said Pinky was not considered bloated, since she had been shaped like this for 3 years since I've had her. They suggested x-raying her and doing an ultrasound, but that would have come out to over $1000, the visit was expensive enough. They sent her home with 2 medications, an antibiotic "Baytril" and an antifungal "Sporanox." The instructions were to give both medications for 14 consecutive days as follows: Baytril - 0.05ml by mouth once a day, Sporanox - add 0.5ml to 5L water and place Pinky in bath for 5 minutes once a day. The Baytril was started at the vet's office on 1/17 so they could show me how to administer it, the next day I gave her both medications and continued to do that daily until I left for vacation on 1/20. My good friend who accompanied me to the vet and is an animal lover and vegetarian most of his life, babysat Pinky and continued administering the meds to Pinky on 1/21 and continued until 1/25. On 1/25 my friend noticed that Pinky was swimming like a top, spinning around pretty quickly. He thought it seemed strange, but he didn't know, so he administered the meds that evening. The next day when he arrived at night, he noticed that Pinky seemed off and was still twirling around, so he discontinued giving her meds. Every day he gave her Reptomin pellets in the morning and at night. My friend said up until she started swimming erratically, she seemed calm and seemed to be eating because some of the pellets went missing eventually. I came home from vacation at 11:30pm on 1/28 and when I saw Pinky she was unrecognizable. I turned the lights on and walked up to her tank and she started swimming so fast, but her torso is disfigured and contorted and it basically looked like she was tumbling in a clothes drier. Sometimes she swims in tight twirls in every direction possible, even upside down and backwards, sometimes her legs flap almost entirely backwards as she's moving around quickly. She's not symmetrical anymore, so when she floats at the surface, she floats lopsided, pretty much on her side. She looks like she had a stroke and when she gets going, she looks like she's having a seizure. I don't know what to do. I feel terrible for taking her to the vet and am wondering if the meds made her this way. I wish I knew if she was suffering. I believe she has been eating. I got a little video of her swimming around erratically, but am afraid to send it and cause your server to crash. I am including some pictures I took on 2/29. Hi there, I was wondering if there are any sorts of diseases/bacteria/etc. that are transmissible from ACFs to humans. About a week and a half ago, I ended up having some frog water splash into my eye, not a huge amount, but enough that I decided to rinse the eye out with eye wash once I had finished with the water change. Around 4 days ago my eye started becoming very bloodshot and hasn't cleared up so far. Maybe I just hit my eye in my sleep and didn't notice or something but just in case, it'd be nice to know if there's anything in particular to keep an eye on. Thanks. last 4 had died off and my last tadpole looks like this (see attached image). the GH and KH are constant. <Constant what? As a reminder, neutral, medium hardness water is the ideal. About 2 weeks ago, when there were 7 left, I altered the water change schedule to 50% every 3 days since the parameters were staying constant. The only issue I've had was the heat going out in the house for 3-4 days but the lowest the house dropped to was about mid 60s (F). but none of them lasted long enough for it to progress to more than a droop. (Note: the final tadpole just died early this morning but I'd still like to figure out what on earth happened to prevent anything like this in the future should I decide to raise more tadpoles at a later date). Additionally, I've fed them Xenopus express tadpole food daily for the past 160-odd days since the tadpoles hatched. Over the last few days, after the heat went out, the last 4 tadpoles all became lethargic and stopped eating/actively swimming. Each of them were receiving about 0.3ml of the tadpole suspension a day in the week prior every afternoon, Xenopus Express' feeding instructions assume you're raising the tadpoles in bulk and don't translate well to smaller numbers. I had almost no issues while I was dealing with a large number of tadpoles but once I was under 20, I found myself a bit uncertain of a good feeding schedule/amount, I'd welcome any suggestions on how much to feed a single tadpole. I have two 14 year olds that are wonderful. One has a yellow color under back legs now. I asked Grow A frog about this and they said it is normal with age. What are your thoughts? The other one is fine and has not changed color. aquarium leaving 2-3 inches on each side open. I have jumpy frogs when the weather changes. They eat pellets from Grow A frog one to two times a day. Otherwise the frog eats and seems normal. Any ideas? I have an African water frog that is currently staying upside down in his tank. I have had him for about 8 years. He has never down this behavior in the past. I thought he was dead. But when I start to move him or take him out of the tank, he swims away. Then goes back to the upside down position. Why is he doing this? Hello, I have a 15 year old African Clawed Frog that has lost its appetite. exclusively float on top or lay on the suction cup platform we have that lets him poke his nose out of the water. I've also seen him vomit more than once in the last week. Additionally, he's developed a curious habit of following us as we walk around the tank and swimming/diving away if offered food. About a week ago, I noticed he we stress shedding and had a tiny ammonia burn. After water changes and the use of API stress coat, the burn's gone and his shedding is almost completely gone (there's a minor bit on one of his toes) as of today. water changes to try to maintain consistent water conditions in case the filter begins cycling. To me it looks like the filter's in the process of cycling. I'm concerned about the PH, for months it was consistently at 6.5, which I believe is on the lower end of the range for ACFs, and I'm not quite sure what caused the decline. Is there any way to induce the frog to feed? He's lost weight and seems to be weaker than before. Both of the younger frogs are behaving normally. <15 years is a pretty good age for Xenopus, so you must be doing everything right for the most part! But the issue here is surely water quality and chemistry. Forcing animals to feed is rarely necessary -- if they're 'happy', they'll eat. So let's review. Xenopus in the wild exist in a variety of water chemistry conditions, but the farmed ones -- which have been bred in captivity for decades now -- are much happier in neutral to slightly alkaline conditions. Between pH 7 and 8 is about right, with medium to high levels of hardness, recommended. Xenopus kept in soft and/or acidic water do poorly, and older specimens may be more sensitive than younger ones. So some attention to water chemistry will be important here. Your site is without a doubt the most informative on various issues/topics. Neale emailed me the other day but I have another question. 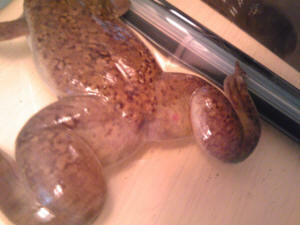 We have an African clawed frog with soft bloat and am working hard to save/help him. We have been doing the Epsom salt soaks. I just received the product Maracyn II today and need to find the right dose. I'm going to treat him in hospital tank. Can the dose be adjusted with the same effectiveness in 1 gallon of water? If so what would the dose be? The Maracyn II is in powder form. Recommended dose is 2 packets in 10 gallons of water. If effectiveness will be compromised I will use 10 gallons of water. I'm a bit dumb with math. Do I split the powder dose (one packet) into 5 doses, then add one of those doses to a 1 gallon tub of dechlorinated water, in which I would put Michael in? <It's 2 packets in 10 gallons, correct? If so, then 1 packet in 5 gallons. I am trying to treat him out of the tank in a separate bucket. As well, how long would I soak Michael? P.S. We got him to eat fresh chunks of salmon! I have read salmon is good for them. Do you know if salmon can be a regular diet? excessively shedding. We became concerned about his health two weeks ago when he refused to eat. Typically, we feed the frogs ReptoMin pellets but decided to try red wrigglers last week to see if he would eat. He ate two decently size worms and satisfied us that his appetite had returned (he's always been a light eater). five days later we found him floating around the top of the tank, we were unable to see bloating and when approached, he swam back to the bottom of the tank before swimming back to the top to float about fifteen seconds later. The next morning we found him floating dead in the tank. Ammonia was a little over 2 ppm. Immediately I removed the deceased frog and took several pictures (Link: http://imgur.com/a/rTL8b) and proceeded to clean out the entire tank along with all decor. The other three frogs were returned to the tank, all gravel at the bottom was removed to prevent future trapping of waste and I started them on a round of tetracycline to be safe. Wanted to get a second opinion and ask how long to wait to place the biological media back into the filter after the carbon has been reintroduced to clear out the remaining tetracycline four days from now. <I agree that this does look like a systemic bacterial infection following exposure to some environmental stress, but without doing detailed microscopy, it's hard to be sure. I think your approach of cleaning out the tank, doing water changes, and treating with an antibiotic is a good one. Hello Neale, finished the full course of tetracycline and two of the frogs are back to eating. The female, age five, however, has been shedding profusely and refuses to eat regardless of the food since the other frog died. Water conditions: Nitrates 20 ppm, Nitrites 0 ppm, ammonia 1 ppm. Current course of action we're thinking is to continue water changes every 1-2 days (dependent upon water conditions) to control ammonia levels between weekly feedings, though we're certainly open to suggestions. We also have a second full course of tetracycline on hand if you think it may help. Can he possibly get better on his own? Is soaking in Epsom salt bath safe and does it help? Will the product Maracyn help? As well, we just fed him his first night crawler today. He went crazy for it, swallowed it then regurgitated the whole worm after few minutes. The worm was still alive so we took it out of the tank so Michael doesn't get stressed. Do you think he spit it out because it was moving around in his belly? And/or could it be because he's not used to eating worms yet? We're trying to do all the right things to help our buddy. Any feedback would be so much appreciated. I’ve been having an issue with one of my female clawed frogs for about a month now. I noticed some kind of bruises on my frog’s mouth, I contacted a vet that has some experience with amphibians but he was unable to help since he was not familiar with this species. <Xenopus is very widely kept my scientists, and only occasionally as a pet. Can I direct you to some reading directed at scientists? I decided to treat this frog with Maracyn 2 per the directions on the package in a hospital tank and he redness was appearing to subside but now it appears to be back again. There is redness around the nostril now too. I’ve tried applying Bacticine with a q-tip to the affected area and Epsom salt baths feeling maybe this was not a bacterial infection and perhaps some kind of physical injury. It looks *slightly* better right now than the picture I’ve attached but I’m not convinced it’s really healing and going away.. there also appears to be a lump on the other side of the mouth you can see from the attached picture too. Is there anything else I could try? The frogs weight is normal and is still the most eager eater I have out of my four clawed frogs, so whatever this is, she is still acting like her usual self. This frog is kept in a 40 gallon breeder with three other frogs, which are not experiencing any issues. I’d appreciate any advice I could get, thank you. I’ve placed an order for tetracycline, it was not easy to find any online though. Hopefully the product API sells is sufficient? I started tetracycline treatment in a spare 10 gallon tank with a sponge filter. I went to go change out 25% of the water and add another packet of antibiotics and my frog apparently my frog spawned a clutch of eggs? Pretty weird, I’ve had this frog for over four years and never had this happen before. I even have a oft frisky male with three females and never seen eggs happen, ever. Should this be concerning? I think the tetracycline treatment has been successful. The redness around the snout has gone away for the most part and the nostril appears normal now. The swelling appears to be gone too. hi, i have had my albino frog for quite some time buying it when it was hardly any bigger than a Congo frog, It has grown within a Large Community Tank 320L (im from UK so don't use Gallons) and now is what i expect Full Size taking up the most of palm of hand However within the past week i have noticed -kind of hard not to. That One of its eyes has became Swollen and Red, As if it had gotten some sort of Black eye, however at first thought i thought perhaps it had a run in with one of my Catfish, but as the days passed its mouth seemed to be forced Open and i see a large Red ~Something~ Only be described as some sort of Growth and it shows no signs of Stopping and only getting Worse, The Red Growth is only on one side of the mouth and Seems to be under the Eye as well. Looks like it might be a clump of Red Flesh but i fear it could be a tumor and a Death Sentence to the frog. i don't really have another Aquarium set up suitable for the frog without Risking others or himself being Eaten. If there is anything i can do to Improve his/her Condition i would greatly like to know as i can find little on the internet. If worse turns to worst and indeed there is nothing i can do, Perhaps there is something i can do to make its Last days as comfortable as possible. It might be worth a note to mention that all my Fish both Scaled and those without scales are Healthy and fine, Water Conditions are also more than Satisfactory and there is no Problems with other Tankmates.....Plus there is nothing missing from my tank so he hasn't Eaten someone bigger than he can chew. i Greatly look forward to hearing back Your Opinions and Feedback, Thanks for listening (Reading).....Lee H.
<Hello Lee. The short answer is that medicating aquatic frogs is somewhat difficult, and the best/most reliable approach is to use antibiotics. A vet will be the easiest source of these, which is awkward I know, but in the UK, the only legal way to obtain antibiotics. Your frog would appear to have an opportunistic bacterial infection, often referred to as Red Leg. I've just experienced something horrifying and was hoping for some information! I have a young African Clawed Toed and was just moving him to a holding tank while I cleaned his tank. (The filter was apparently not working well so the tank needed some extra TLC.) I used a net to catch him and as I went to put him into the new tank his whole body went rigid and stayed that way. I assume he's dead and my heart is breaking. Was it a heart attack? Stroke? Impossible to know? When I purchased him he had a nub for an arm and a bum eye (clouded over and sunken in). He was my little rescue frog and was healing very well (his arm had grown back and was just missing fingers!) Before catching him for cleaning tonight he was moving about and avoiding the net more than usual. He seemed mad while in the net and would not chill out. It's like he tried to hop out of the net and was frozen in time. He's in the holding tank now with just enough water to cover his body, but not so much that his nose is under water. devastated. Is there any hope? Almost 20 hours later and Rigor Mortis has set in, so it would seem that he has left us. Thank you for your quick response, it helped me calm down enough to get through the work day. Information is so powerful in that way. My guess is a cardiac event due to the blood pooling. Thank you again. I'm so glad that you were there to help. 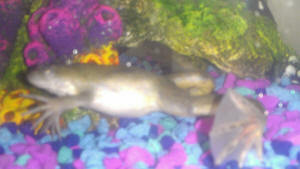 I have an African clawed frog for the past two days he has been "gagging". I thought he was dead because he was tank on his back. When i got the net to get him he moved i don't want to lose him. How can i help him? Also follow the links at the top. Virtually all problems with aquatic frogs are related to their environment, i.e., how well (or not) they're kept. Hi. 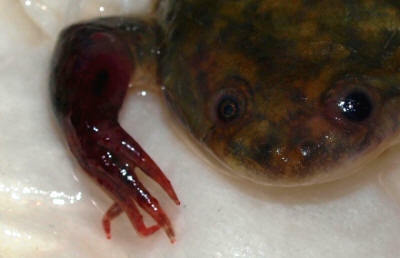 I had two African Clawed frogs, a male and a female, each a little over a year old. I changed out their water about 3 weeks ago and my female laid eggs all over the tank. This was her first batch, I never saw them mating, and none of them hatched. After she laid the eggs she stopped eating completely, but my male seemed fine. Tonight I found her dead at the bottom of the tank. Do you have any idea what happened? Should I be worried about my male? <African Clawed Frogs, Xenopus laevis, should live for at least 10 years in captivity, so if one dies after only a year or two, then you should definitely review environmental conditions, diet, and other aspects of healthcare. Or put another way, yes, you should be concerned, if not actually worried. As for specifics, it's impossible to give any insight without information on the size of their aquarium (should be at least 10 gallons, preferably 15+ gallons); diet (varied, no "feeder fish", and only fed every other day); temperature (subtropical, around 20 C/68 F); and water quality (filter essential, plus at least 25% water changes weekly). Thank you for responding so quickly. My frog is kept in a filtered 10 gallon tank, but it is not heated. His tank is at 65F right now. Is this too far away from 68? <It's a little cool for good health, yes. Is there a warmer room in the house? Alternatively, get a fish tank heater (preferably one with a wrap-around plastic grill to prevent burning) or use an angle poise light with a bulb (a regular incandescent could work, but a reptile vivarium heat lamp would be better). So lots of options depending on your cost and convenience needs. Do note that the warmer the frog, the more active it will be, and the faster (and therefore better) it will digest food. He also eats pellets every day. I've tried feeding him worms and shrimp, but he didn't seem to like them. <Hunger makes the best sauce! Don't be afraid to starve your Xenopus for several days, even a week before trying something new. That said, modern pellets are an excellent staple, provided you're buying a good quality brand. Labs that maintain Xenopus use nothing else and have great success. I will check the pH of his water, try skipping a couple days of feeding per week, and try shrimp again. He doesn't appear to have any sores or lesions though. Thank you again for responding and the reading. energy to swim around? What should I try to encourage the frog to eat? Thank you for your help. We will try a better diet and search at the websites you suggested. Just as I sent my email to you, my son offered the frog his regular diet by holding the worms up to its mouth with a tweezers and the frog ate the whole block in one gulp! I am still quite curious to know how it could stay alive without eating for a month. I have three African Dwarf frogs that I keep in well-water only in a medium-sized terrarium jar. Typically I am very adamant about changing their water as soon as it begins to appear cloudy, but this week I was stupid and lazy and didn't until it was really icky. When I change them, I put them in a small vase with clean water to allow them to swim and rinse themselves off. Usually it's only for several hours, but I noticed one of my frogs were shedding so I left them in there until it was done--this took two days. Tonight I was letting them move around in our kitchen sink--we rinse it and put a little well-water in the bottom--when I noticed one of them had red feet. So I picked him up and was holding him on a paper towel and saw his feet are bleeding! :( What does this mean, and is there anything I can do? Right now he's in the little vase in some clean water with a handful of the river rocks we keep in the big jar. <There's something called "Red Leg" in frogs that's often a death sentence. Also, we have an abundance of spider plants at our house, and we were wondering if we could use one of those with the frogs. Are they safe? <Spider Plants (assuming you mean Chlorophytum comosum) aren't good choices for aquatic frog habitats because Spider Plants do best in free-draining soil, so don't like their roots being somewhere damp all the time. Only a few houseplants really thrive in vivaria, mostly those that like humidity. Classic choices are Syngonium and Philodendron, which can be potted above the waterline but will happily grow down to the water and may even put a few leaves below the waterline without complaint. "Lucky Bamboo" can do well with its roots in the water and the leaves above, but it's very demanding about light, but brightly lit spots in the house may get too hot for your frogs, so approach with caution. In any case, do an online search references "vivaria" with "plants" and you'll find dozens of alternatives. I noticed today that the redness that was encompassing his feet has gone down to mostly be in the webbing of the feet. I've noticed names of various medicines that have been used or recommended, but for my situation which would you recommend? this is not a question, but I´ve just read about the ADF with possible "Red Leg" infection, so I wanted to share my own experiences with this syndrome (if this is of interest; if not, feel free to ignore this Email ;)). A few months ago, I wanted to get a few buddies for my two ACFs (an adult pair, 42 gal tank, filtered, fully cycled, planted. No problems). I was able to acquire three frogs from a lab (one male, two females), which I moved into a 30 gal quarantine tank first. Smooth sand bottom, two terracotta pots, floating plants, an adequately sized canister filter. I checked the water daily (0 NO2, << 25 ppm NO3, pH 7.2, temp. about 68 °C, moderately hard water). They settled in just fine and for the first few days, everything was ok; they were active and always hungry just like my other frogs. But after six days, the new male suddenly became listless and had two tiny red spots on his feet as well as slightly swollen hind legs. I had a bad feeling about that and immediately separated him from the females before doing a large water change in the 30 gal tank. The next morning, he was barely moving and had several severe hemorrhages (he spent the night in a clean tank without any decor, so an injury is out of question). I took him to a vet, but it was too late and he died in the evening of the same day. Because of the very fast progression of this infection (36 hours from a perfectly healthy frog to death), the vet gave me some Baytril to treat the females which didn´t show any symptoms yet preventatively. Luckily, this was successful and I could move them to the display tank four weeks after the end of the treatment. In this case, I can rule out environmental problems as a cause. The frogs have lived under stressful conditions in the lab and I know of some deaths due to Aeromonas hydrophila in the colony before; I think the inevitable stress from being moved was just too much for this frog. I just wanted to show that this is a very dangerous disease which requires a prompt reaction. The photo shows the frog shortly after its death. I just wanted to let you know that we did get the medicine, and are on the third day of the treatment. I have been putting both types of Maracyn in the water, which is how I understood what you said previously. But ever since I started it, a white fuzz has been gathering on my frog. Is this just from the medicine or is there something else wrong? Also, does the Maracyn cause the frogs pain? Because when I sprinkle it in the water, I notice he twitches around and seems like he's trying to escape from it or rub it off on the rocks in the water. Hello! Last night, and I don't know for how long, my 2 year old albino African Clawed frog Bean managed to somehow get the tube cover off of my water filter, and got himself stuck in the tubing. I got him out, and he looks no worse for ware, but his back legs are bruised. His left leg much more than the right, and he lost one of his claws in this process. His bones seem to be in tact; in his struggle in the filter tube, I think he mostly just had water running over him. The constant flow of water must have bruised him, or his struggling to get out must have bruised him. His webbing between his toes doesn't seem to be torn anywhere, though his toes are a bit swollen from the debacle. I've put him in an isolation tank, with shallow water so he doesn't have to use his back legs so much so he can still peek up and get air. Other than putting in some drops to help prevent infection, and keeping his water warm, is there anything else that you would recommend I do? He's a wonderful well mannered little frog, and otherwise in good health up until this mess. I'm keeping a close eye on him, and he hasn't gotten any worse (or better) in the last few hours. Thank you so much for any help you can give. Thank you so much for your quick help! He is doing a bit better today, his redness has gone down, and a lot of his bruises are now getting to that kind of white scabby color. He has no new injuries, so red leg or anything hasn't set in as far as I can tell. He is a bit active today, swimming around a lot despite his injured feet. I don't know if this is because he is cranky and in pain, or because of something else. I've noticed a few times after he goes for a swim, he does a few almost has recoiling jerks of his feet as if he's hurt himself by swimming, but that doesn't seem to stop him from swimming around again moments later. He is has a tiny amount of Maracyn in his water to help try to prevent infection. It is the best medicine I could get him, it is against the law in my state to get him anything stronger without a vet visit (I think the long car ride would do him in). Would you recommend anything else? Is it alright for him to be moving around so much with his feet still in poor shape? He is in a large shallow jar about the width of a dinner plate now while he is under observation. I've attached a photo of him today. His injuries are healing well enough, but I think some kind of fungal infection may have gotten to him while his immune system is down. He is twitching a lot mostly in his injured feet, but now his hands. No vet would sell me any antifungal/antibiotic stronger than the Maracyn oxy I have. Is there anything you can recommend? He's a strong little frog, and I'm sure his injuries will heal (his injuries are only in his toes now, as opposed to his whole feet a few days ago) if he has time, but this fungal (?) mystery twitching thing worries me greatly. <Go to an aquarium shop and buy an antifungal medication. Methylene Blue is an old school medication that should be safe with aquatic frogs, but it's a mild medication and does tend to stain things blue. Where I live, the UK, my favourite medication for fungus and Finrot is eSHa 2000, a good, reliable medication. It's widely sold in Europe but doesn't seem to be sold in the US. In the US, something like Kanaplex would be a good, if not better alternative, combining anti-bacterial with anti-fungal properties. Hey there! A few weeks ago, you helped me to treat my frog Bean after he had gotten stuck in his water filter. While he has lost a few toes (though I am hoping they'll come back) he is back to his normal self, alert, swimming around, eating lots and croaking at night. So thank you so much for all of your help in getting better again, I don't think I would have been able to do it without you. <Ah, this is good news Kelsey; thanks for the update and the kind words. We have two albino frogs that we have had in a 10 gallon tank for about a year. They have been doing fine, until recently one of the frogs appeared to be stuck to filter in the tank when I came into work in the morning. At first I thought he was dead, but when I tried to remove him from the tank but he began to move. So I knew he wasn't dead. I removed him from the tank and put him in a small tank. He has just stayed at the bottom of the new tank and occasionally floats upside down. I use a net to turn him back right side up and he seems to stay that way for a few hours. He does not appear to be eating or swimming much and his back legs don't seem to move at all. The outline of his back feet and the tops of his front arms appear to have a red outline. The other frog has been rather quiet and not eating either, but I have kept that one in the big tank. I recently added some plant bulb s which have sprouted in the tank, but I didn't think that these would harm the frogs? I have added a few drops of Start Right to both tanks to see if that will help? Any suggestions on what we can do to save one if not both frogs? <The aquarium is probably too small, but have you tested water quality? What is the water temperature? What are you feeding these frogs? Xenopus laevis is relatively easy to keep, but they do have some needs, and if you don't provided for them, then things go badly. Almost certainly you are dealing with something called "Red Leg". It usually happens when frogs aren't kept properly. It's treatable, but you will need a combination of Maracyn II with Maracyn Plus. Otherwise a slow, painful death is certain. Hi I have been researching dropsy or bloating in Xenopus laevis. My frog appears to be bloated but I cannot tell. She has been like this for quite some time. She appears to active and is eating fine, which is why this has never worried me before. 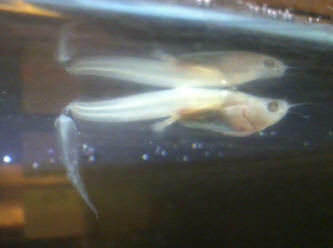 She is housed with an albino male, who does not appear to be bloated at all, in a 20 gallon tank with adequate filtration. She does eat more then him but she is by no means overfed which is why her size concerns me. I feed her ReptoMin sticks every 3 days. but with winter coming I have slowly warmed it up to about 72 degrees. Any help would be appreciated, I have attached a picture of her for you to see. Thank you very much. She appears to be improving. Must have been the cold temperature before. i have a problem with my male African clawed frog. he is about 10 months old. i was keeping him with my female acf in a 20 gallon tank, with a small mechanical under water filter, doing full water changes once a week, every week. about a month ago i noticed that my male was lethargic and only ate quite little. he seemed to have an appetite, would start eating but then stop very quickly, like he was full. then i noticed some red 'veins' on his belly. he also would stay on top of the water a lot and breathe, keeping his head out, instead of just touching the surface with his nose. i isolated him in a small tank with no filtration and treated him with tetracycline foe 5 days. then i gave him 12 minute long Baytril baths (2,5 mg in 0,5 liters) for 10 days. no medicine was added to the water where he was living and i was doing half water changes every day. he didn't get better, nor worse. after that i treated him with Chloramphenicol - 130,8 mg/g in 30 liters for 3 days. then i left him without treatment for a few days, keeping up with daily water changes. during all treatments he was shedding quite often. as he still didn't get better i treated the water he was in with Octozin for 3 days and since then i have left him without any treatment. what should i do? he hasn't been eating much. after a while he almost stopped. since 3 days ago he's been eating a little more, but not enough or the way he used to and should. just a little more. he sings a lot and since yesterday swims around a lot. but he doesn't look well. red "veins" are more visible on his body - belly and legs. should i start the tetracycline again? is Chloramphenicol more effective? any help is much appreciated!!! This is a very useful and succinct review of Xenopus health. The likely problem is what we call "Red Leg" which is really any opportunistic bacterial infection, similar to Finrot on fish. For a bit more depth, see the RSPCA (the main UK animal charity) document on Xenopus. While aimed at professionals like scientists who work with these animals, there's much of use for pet owners too. Section 4.10.4 on Common Diseases discusses Red Leg as well as Nematode infections, the two commonest problems. Diagnosis and treatment are outlined. Pet shops may not be able to provide the necessary antibiotics (specifically, Oxytetracycline) but your vet will surely be able to. Hi, my name is Sam and I have had my ACF from about a year now. I changed the water in her 5 gallon tank about 2 weeks ago and she seemed totally fine. and when I went to change the water again, I noticed that her front and back legs seemed somewhat pink in color and she seemed a bit bloated. a product they had to treat bacterial infections. I put some in the tank when I got home, but I am still worried about her. Any suggestions about what is wrong with her and what I should do to treat her would be extremely helpful! Thanks again! Sam! There is a picture that is attached as well. I know the quality is not good, but she likes to move around so it was the best I could do with my phone. Thanks again! 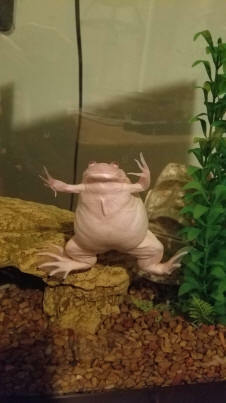 Hello, I have two albino Xenopus toads which I bought about two months ago. 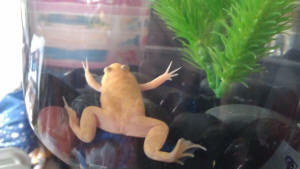 I have two African Clawed Frogs in a 40 litre aquarium. They were doing very well and cohabitated peacefully with the other inhabitants of the tank. Recently I noticed that one of the frogs was suffering from a swollen leg. The swelling is in the "ankle" area just before the webbed feet. The webbing seems okay but the affected area has become dark black. The frog is not moving much, preferring to hover near the surface of the water and seems to have difficulty in moving that particular leg. He is eating normally, but not moving much. The temperature of the water is 78 degree Fahrenheit and I carry out water changes regularly. The other frog seems to be in good health. Can you give me some advice as to how to treat this problem? Thank you very much. Redness and swelling of the limbs is dangerous, and difficult to treat without antibiotics. It's a bacterial infection, but triggered by environmental conditions, so review and act accordingly. Just wanted to thank you for finding the time to write back with your valuable advice. The frog's leg is slowly getting better day by day. <Glad the help was useful. Good luck, and thanks for the kind words. 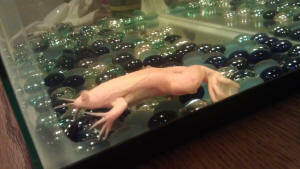 I have an albino African clawed frog, and just lately she has this slime/mucousy stuff coming from her mouth. Is this normal or is she sick? I couldn't find any info about this online anywhere! I recently saved a baby African Clawed Frog from a local pet store. He was previously rooming with another SCF s little bit older, and was doing absolutely great! I clean their tank (25 gal) weekly, and I found some marks on baby that resemble bruises. I immediately segregated him from the other frog and goldfish. Are there any recommend treatments tot the little guy? Thank you! I have an albino African Clawed Frog that has been happily sharing a 20 gallon tank with a cichlid for over two years. The frog is about 4 inches long by now. We also have two cats that have always shown fascination for what's going on in the fish tank, and they spend endless hours watching the movements of the frog and fish. Well, turns out that all this time the cats were actually on a surveillance mission and the other night they finally decided to put to use the intelligence they had been gathering, and launch a strike. Shortly after we all went to bed, I heard what seemed to be someone gagging and vomiting. I run to my daughters' bedroom only to find them placidly sleeping. I then went downstairs and found the following peculiar scene right by the front door, two rooms away from the fish tank: one cat looking at me with a "I didn't do it" look in his face, another cat violently gagging and throwing up some kind of white foam, and the albino frog on the ground trying to take advantage of the distraction to make a escape. I immediately put the frog back in the tank and checked for injuries and scratches. All I could see was a little wound in its right hind leg that looked scratched and as if the skin had peeled off. Otherwise, the frog was swimming and moving around (first frantically, but then it settled down). I have no clue why the one cat that apparently bit the frog was gagging so violently, but the following morning she was ok. I have looked it up and I cannot find any data about albino frogs being toxic to cats. The frog also looked fine the following morning, but by the time I came back from work, it had developed an enormous lump in its back. I was hoping it would be swelling from being hit or bitten by the cat, and that it would go away, but it's been four days and the lump is still there. Any clue on what to do about this? Thanks! I have already started the antibiotic. Frog seems to be ok, although the lump is still there. Thank you for reading my email. 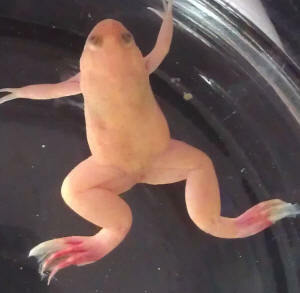 I recently bought an Albino African Claw Froglet. Im not sure of the age. When I first brought him home he was fine. I set up the tank after doing research on this little creature because the pet store that sold him to me didn't know much about their species. yet but change the water ever couple of days so its not too messy in the tank. The pet store said that they just put fish pellets for the fish in the tank and guessed that the frogs ate them too, I have bought freeze dried Hikari Tubifex Worms or him to eat. Sadly, now that I've had him for a couple of weeks Im noticing very strange behaviors and I cant seem to find any diseases that match his criteria. When I first brought him home I used hard water because I didn't find any articles saying I couldn't. He was fine at first but after a couple of days he started swimming oddly, swimming up to the top and then floating down over and over and when Id turn on the light or walk towards him he'd start thrashing his legs. Doing more research I found out hard metals are toxic so I bought Aqua Safe Plus by Tetra which is a water conditioner and dechlorinator all in one. I changed all of the water and added the conditioner in to fresh water. So to keep you updated on the time frame he was in the hard unconditioned water for about a week then I changed the water with the conditioner. I still used the hard water but I thought the conditioner would help, but he wasn't getting any better, in fact he was getting worse, he was now trashing at random times and spinning so that his belly would be facing up and then he'd flip over for about a minute over and over. Then he would stop and just float around my guess was that he was exhausted from thrashing. Today I decided to get regular city tap water for him and added the conditioner/dechlorinator to the water hoping he would be able start controlling his legs. When he first started thrashing I thought he was just nervous around people but now I fear there is something more going on. It seems almost like he is epileptic and it gets set off by people walking towards him. I haven't moved him to a shallow tank because I often look over and he is floating at the top where he can breathe. The closes symptoms I have been able to notice are cramping leg or slightly paralyzed leg syndrome but I wanted to check in with the experts before I tried any remedies. Any advice you can give would be very helpful. Sorry for the length, I wanted to give you as much detail of the situation as possible. Thank you for your time. I have 4 ACF's (2 male and 2 female) that are all 4 - 4 1/2 years old, housed in a 30 gallon tank. (I realize this may be a bit small for them, that they should be in at least 40 gallons). They have been housed the same for at least 3 1/2 years, with 2 filtration systems and a water heater that is set to 75º. They are fed both ReptoMin pellets and freeze-dried blood worms about 2 - 3 times a week (read other places that we are not supposed to feed every day/every other day?). We recently started feeding, as a treat, frozen cubes of shrimp. (Not sure what brand...bought at Petco. Tiny shrimp frozen into cubes). We have also fed earthworms as a treat once every few months or so. Their tank is also bedded with small gravel rocks (the colored type). I know from reading about these frogs that these types of rocks are not recommended, but we had never had any problems with them before, so we never removed them. We also treat the water with Amquel Plus. A few weeks ago, we noticed that one of our males was getting unusually skinny. He had lost all of the black coloring on his arms/fingers, and looked to be very emaciated. His veins also appeared to be a much brighter red and more visible than the veins on the other 3. We observed all 4 ACF's when we fed them, and this particular frog seemed to be so lethargic that he either refused to or could not swim to the top to feed. Thinking our quarantined frog had some sort of bacterial infection, we began treating the water with Pimafix (made by API, described as an Antifungal Fish Remedy...bottle indicates it also treats internal and external bacterial infections.) I bought this to try only after speaking to somebody at Petco. This did not seem to help any. In the quarantine tank, he seems to be eating okay. He is now going to the top to eat. In addition to pellets and blood worms, we have also been feeding earth worms more often (not in the same feeding), trying to bulk up his diet in order to put some more weight back on him? He now has the black marks on his fingers/arms again, but is still extremely thin. He has been in this quarantine tank for approximately 2 weeks, and we do not notice any poop in his tank. With the amount that we have been feeding and watching him consume, if he was not pooping, I would assume that he would be bloated, as if he were blocked. When he has not eaten, he appears really thin around the waist/stomach area. His legs also still look very thin (like you can see his bones more). I cannot seem to find any useful information on ACF's getting thin while still eating plenty. I have attached several pictures (best I could take at the moment). The lone frog is the skinny one that I am emailing about. I have also included several pictures of the other 3, to give you an idea of how big the others are. The pictures of the lone frog are about 15-20 minutes after a feeding of blood worms. I would assume that if he had swallowed a gravel rock and was impacted, that he would be getting bloated more and more after each meal? If you think this is because of a swallowed rock, are there any ways that I can help him pass it? If you think this is more of an internal infection, can you recommend any treatments? Any advice or suggestions that you could give would be more than appreciated. I plan on picking up some Maroxy 2 this evening/tomorrow. Just a couple of side notes: I emailed you guys a couple of years ago with a picture of my from with ammonia burns/septicemia. (The homepage picture for Xenopus Disease). After a dose of Maroxy 2, an added filtration system, and proper water changes, he healed up just fine and is doing well! Also, I was reading your Xenopus Reproduction section and noticed that you didn't have any pictures up. It also sounds like most people don't have any idea what the frogs will look like when mating. I just wanted to send you a couple of pictures that you could add to your site if you wish. Like I said, we have 2 males and 2 females. All 4 were going at it in these pics. I was wondering if you could point me in the right direction. I believe we have jacked up our tank cycle. I have two tanks setup. The first is the 30 gallon that all 4 ACF's reside in. The other is a 5 gallon quarantine tank. (This tank was never properly cycled...trying to do that now). The 30 gallon tank is showing 0 Ammonia and Nitrites, somewhere between 30-40 Nitrates, and the pH level, no matter what I do, continues to plummet to 6.0 (possibly lower). I have even tried pH 7.5 (API) to raise the pH level, but it never holds. I used the recommended dose for the 30 gallon and it raised the pH from 6.0 (or whatever is was at prior, possibly in the 5's) to approximately 7.0. Now, 3 days later, I am closer to 6.4 and dropping. From what I have read, and from the local pet store owners I have spoken with, Nitrates and pH go hand in hand. The higher Nitrates rise, the more unstable and acidic your pH can be. I know that when a tank is properly cycled, Ammonia and Nitrites will drop to 0 while Nitrates will start to rise. With weekly and routine water changes, you should be able to keep Nitrates in check. The 5 gallon tank had housed the sickly frog, with a carbon filter. When we began treating with Maracyn 2, we removed the filter and did not replace. The only filter cartridge in the filter system now is the black filter that came with the system. I do not have any rocks or livestock in this tank at this time. I assumed (and probably incorrectly), that the bacteria that had grown on the black filter would be sufficient to cycle this tank. We removed about 75-80% of the water that was treated with Maracyn 2 and replaced with Amquel Plus conditioned water. After this, Ammonia and Nitrites were reading 0.25, Nitrates were 5ppm, and pH was approximately 7.4. Now, 3 days later, Ammonia and Nitrites are closer to 0.50, Nitrates have remained constant at 5ppm, but pH has plummeted to 6.0 (possibly lower). pH straight out of our tap is above 8.0. From what I have heard, from online and from pet store owners, Amquel Plus can lower pH SOME, but not by this much. Do you have any ideas? Are you guys available to speak with over the phone? I am getting mixed messages from the local pet stores. Some say to add Nitrate reducing chemicals and pH stabilizers while others say to do a 10% water change once a day for a week to lower Nitrates and stabilize pH. Have a look at the Rift Valley salt mix, and make up new water using that, but to begin with, only use HALF the dosage recommended, since you don't need water as hard as Rift Valley cichlids. Another thing is to draw the water from the tap and let it sit overnight, and ideally 24 hours, so that any dissolved gases can evaporate. Some tap water is chemically unstable. At this point in time, I do not have a "safe" place for my frogs to live in if I have to cycle their tanks from scratch. I cannot seem to find any consistent information for cycling with livestock, or if this is even possible. Any suggestions or ideas you have would be appreciated. Just wanted to follow-up with you guys. I have attached a series of pictures. The first 4 are from when I first emailed you guys about my frog looking emaciated, refusing to eat, and while he was behaving as if he was lethargic (around Sept. 20, 2011). You had responded that this sounded like red leg. I began treating with Maracyn Two. (Treated for the full week and had removed the carbon filter during that period). After the full week of treatment, we replaced the carbon filter to end treatment. At that time, he was only willing to eat night crawlers. A few days after the first round of Maracyn Two treatment, he took a turn for the worst. His toes/feet were tightly clamped. He started getting open sores on his "knees" and the webbing between his toes became infected and began to rot off. I read a little more into red leg and found that in the later stages, these frogs can start to develop open sores and their limbs will rot off. I also read that once it gets to this point, there is almost nothing you can do for the frog, that it is already terminal. Sure enough, his toes started to slowly rot away, down to the bone until the bones snapped off. Not willing to accept the fact that our frog was probably past the point of saving, we tried a full week of very aggressive antibiotic treatment. Once again, we removed the carbon filter and we began dosing with Maracyn Two AND Maracyn TC (Packages said both treat the same things expect that TC also treats septicemia). The packages for these medications say to dose once daily for a full week. We were dosing every twelve hours with each. (Basically quadrupling the recommended dosage - pet store owner suggested that he doses his fish/frogs with medicine every twelve hours when they are sick - he mentioned that after 12 hours, the frog/fish has absorbed everything they can from that dose). The next 4 pictures show his condition while treating with these two medications. (Maracyn Two causes the water to turn cloudy while the Maracyn TC turns the water orange). We stopped treatment after a week. We were concerned with the cloudy/orange state of the water for longer than a week, especially since we were dosing him 4x the recommended dose. We replaced the carbon filter to stop the treatment. He was still eating at this point. We were (and still are) feeding him once a day with the frozen blood worms. He was willing and able to eat a whole cube. We figured as long as he was now eating and pooping regularly, that maybe we were headed in a good direction. But then his sores started to get worse, and he developed more. (One behind each arm and one on his back side). His toes also began to rot away more rapidly. During this period is when we noticed bare bone exposed/snapped off on his toes. The next 2 pictures show this condition. Kicking ourselves in the rear for stopping the double treatment with the Maracyn medications, we went back to the pet store to get more of each. While there, they recommended we try KanaPlex (made by Seachem - active ingredient is Kanamycin). This medication says to dose once every 2 days, for a maximum of 3 doses. Again, we went with the more aggressive route. Instead of every other day, we are treating with this medication once a day. We are also not going to stop treatment until his wounds are healed and he looks to be back to normal. We are on day 5 of this treatment and everything seems to be getting MUCH better. He has developed new webbing between his toes and it looks like he might be regenerating skin/meat on his toes with exposed bones. His sores also seem to be healing. During this entire period, he had also became so skinny that he lost his "fat packs", the large humps that these frogs use as energy storage around each kidney. With daily feeding and a daily dose of this medication, he has "refilled" one pack and is working on the other. With all of that being said, I do have a question or two. 1) Do you know at what point overdosing with any of these medications might become an issue? They seem to be working and not harming at this point, but is there a time limit that these doses might be good for? Will they eventually begin to do more harm than good? Also, have you had any experience with successful treatment of red leg once it gets to the point of rotting limbs off? From what I have read, a lot of websites recommend to euthanize once it gets to this stage. once the bones are visible in the thigh or shins, it's time to euthanise. The odd lost toe isn't a big deal if the frog isn't otherwise in trouble; amphibians may even regrow lost toes. But if Red Leg is happening, and the main part of the leg is infected, so much so the leg is clearly gangrenous, it's time to painlessly destroy the frog. I'm not an expert on euthanising frogs though. However, the RSPCA (the British equivalent of the ASPCA in the US, publish a document on Xenopus welfare that includes information on euthanasia. In a nutshell, they recommend MS-222, which may involve talking to a vet or animal rescue. A fish anesthetic like Clove Oil might work, but because frogs breathe air, and can hold their breath quite a long time, this isn't something I'd recommend unless you understand what you're aiming to do and how you'd prevent the frog from breathing. Benzocaine has also been used to kill frogs humanely, and may be worth considering. Benzocaine can be purchased from drugstores. 2) This frog is still quarantined from my other 3 ACF's. I know that this disease is HIGHLY contagious. Our sick frog was housed in the main tank with the other three for a long time while he was emaciated and lethargic, before quarantined and started treatment. The others have not shown any signs, except for two days ago. I noticed that while they were stationed at the bottom of their tank, (presumably sleeping/resting), all three had clamped toes/feet. None of them are looking red, I cannot see their veins as I could with the sickly one, and they are all still very well rounded and eating normal. As soon as I turn their light on, or disturb their tank in some other way, they "awaken" and they spread their toes like normal. I don't think I ever would have noticed their feet had I not been caring for this sick one. Should I start treating their tank with the normal recommended dosage incase they have the early stages of red leg? Or is it normal for these frogs to have clamped toes while they are sleeping? P.S. I have also attached a couple of pictures of the other 3 frogs. You can see that they look MUCH healthier than this sick one. I have a 3 year old female African 3 Clawed Frog who has a filtered 20 gallon tank all to herself. She has had a dark spot on her back for several months that seems to be getting larger. She does not act sick or have difficulty moving, but I am concerned that it may be a tumor (perhaps a melanoma of sorts)? Have you ever seen anything like this? Thanks in advance for any insight you can provide. I'm pretty fond of the little critter. My Albino Clawed frog just shed its skin and is has not stopped twitching since. Arms, fingers, toes, legs...pretty much anything that he can move is twitching. He is still swimming around just fine but he has never twitched (to my knowledge) before. I was nervous that perhaps his water was dirty and affecting his new skin so I changed out close to half of it. I feel really bad for him. Is there anything I should do or is this normal. It doesn't look normal. <Hello Emily. Sometimes frogs shed their skin more quickly than normal when there's irritants in the water. So check the water is clean (i.e., filtered) and that you're using water conditioner with each weekly water change (use a conditioner that removes not just chlorine but also Chloramine, ammonia and copper). Check that there's nothing "foreign" in the water, like a rusty nail, that might be producing toxins or irritants. I noticed just an hour ago that one of my female frogs looked very weird. On one half of her body (her left side) is swollen. She only appears swollen in the stomach area. It kind of looks like it could be a hernia to me, but I couldn't find any info online about frogs with hernias. She appears to be swimming alright, other than wobbling just a tad. I have a 110 gallon tank. There are only two albino African clawed frogs, both females. They are also pretty big. I have had these two frogs since they were pretty small (a little over 7 months now), and they have never had anything wrong before. I also have 3 cichlids. They are pretty calm and rarely aggressive. If they get aggressive it is usually only towards one another and not towards other tank mates. I have 6 other small community fish as well. I'm not really sure what information is important. I do regular and consistent water exchanges. I do use aquarium salt and stress coat. I just put in two live plants for the first time yesterday. Every time I have had my water tested it has come out good. I get it tested by my local fish store. I feed super color cichlid pellets, and I supplement with a dried mix of krill, red shrimp, and Mysis shrimp. I also supplement with bloodworms sometimes. I have not noticed her eating anything tonight, other than her skin that she just happened to be shedding. I am not very experienced with frogs. I just read about not having gravel in the tank, which I have in my tank of course. I am leaning towards thinking she is impacted, but she doesn't look like the photos of other frogs I have seen that are impacted. I currently have her in quarantine in a smaller tank. I was afraid of her swimming around too much, or being stressed out by other tank mates while being hurt. I included some pictures, but they are small. Thank you so much in advance for your help! I want to help my little girl out. After doing some further research, I am also surprised that everyone in my tank seems to get along. I've never seen the frogs be aggressive towards the fish or each other, and vice versa. My frogs and cichlids are pretty calm and docile from what other people have been saying. Thank you for the information! That makes me feel a lot better. I added her back to the big tank, and she is still eating and swimming perfectly fine. My two year old albino ACF has suddenly developed a lump under the skin at the top of his leg, just down and across from his bottom. He appears to be his normal self, feeding and swimming without any difficulty and the lump doesn't appear to have changed at all in the last couple of days and he is not bloated or discoloured in any way. I feed him every other day on a mixed diet of frozen thawed red/white mosquito larvae, Artemia, daphnia etc, live mini meal worms and dried fish flake. Is this likely to be a tumour or some sort of bowel blockage? eat much. The use of Epsom salt and live daphnia or live brine shrimp will usually shift constipation. But tumours are virtually impossible to treat. Many thanks in anticipation for your advice. Many thanks for your reply Neale, it is very much appreciated. Since posting my message, my frog has allowed me a better opportunity to get a really good look close up at the lump and it is in fact where I can best describe as directly over his right bum cheek (were he to have one!) I can say with some certainty that it is not in his leg. His stomach and the rest of his body is not bloated and I have watched him eat both the frozen food and the live with his usual vigour in the last few days but the lump has not passed nor changed in size/shape. My husband is firmly in charge of keeping the tank in tip top condition and I am confident this is all at the correct level. It really is baffling and I feel rather helpless and very worried about my little webbed one. <Sorry I can't offer anything more concrete to guide you to a quick cure. If you Google terms such as "tumour" with "Xenopus" you'll see that such things are commonly investigated in laboratories, Xenopus laevis being one of the classic lab animals. Tumours may be genetic, but they can also be caused by exposure to heavy metals (for example copper) and various other chemicals that are toxic rather than immediately fatal. Vets can remove tumours depending on where they're located on the animal, and when performed properly, the frog can go on to enjoy a long and happy life. That's all noted, many thanks for your advice Neale. I have had my ACF Gus, for almost 10 years now. He has never been ill in his life with me, until I noticed some worrying things over the last few days. Gus has always been on a diet of ReptoMin, and maybe once a week frozen bloodworms. Gus lives in a 55 Gallon tank, with no fish of any kind. He lives alone, with lots of fake plants and hiding places. He is a very spoiled frog! He has a waterfall filter that I run a few times a week. I do regular water changes as well. I decided to do a full tank draining last weekend to redecorate his space. I put him in his bucket until cleaning was done, and returned him to his home. Oh, and just to add, it is tap water, and I always put tap water conditioner in with every water change. Later that night I noticed he was curled up in a ball sort of , legs tucked in. I didn't think much of it because sometimes he sleeps this way, but he did not do his usual night singing, and did not eat his bloodworms that night. The next day I noticed he was shedding excessively, and has not stopped since. The webbing in between both back feet is also torn, and red around the tears. He also has some small white spots that appear cottony, and a few small red spots as well. For the last 4 days I have kept him in a 5 Gallon sort of hospital tank, changing the water every day, and doing a diluted Pedialyte bath once a day. He has been eating for the last 2 days, very well actually. But he is still sluggish, and his still shedding like crazy. Any ideas?? I love him very much and I want to get him the proper treatment. People have told me everything from Lamisil, to aquarium salts, to tetracycline and I am not sure where to begin! Here are some pics of recent days. Thanks so much for the advice, me and Gus really appreciate it! His webbing appears less red today which I suppose is good! I will try doing everything you suggested! I had written you about my frog Gus. Well I have confirmed now it is indeed some sort of fungus. He has stopped shedding, but now he has white little cotton ball things all over him. How do I fix this?? Please help thanks! I bought aquarium salt and tetra fungus guard..are these safe and please advise on the dosages thanks!